"Every fella here wants to live, the only way that happens is if we work together!" Disney has debuted a second trailer for The Finest Hours, the Coast Guard drama starring Chris Pine as a young member of the Coast Guard who goes on a daring rescue in the 1950s. This trailer is timed for release on Veteran's Day in the United States, though this is more than just a story about dedicated, hard-working veterans. The full cast includes Ben Foster, Eric Bana, Holliday Grainger and Graham McTavish. This looks like a very intense, very riveting story of an incredible rescue at sea. I'm quite interested to see how it all plays out. You can also still watch the first official trailer for The Finest Hours here, to catch even more footage. The Coast Guard makes a daring rescue attempt off the coast of Cape Cod after a pair of oil tankers are destroyed during a blizzard in 1952. Billed as "The Most Daring Rescue in U.S. Coast Guard History." This was filmed mostly around Massachusetts. 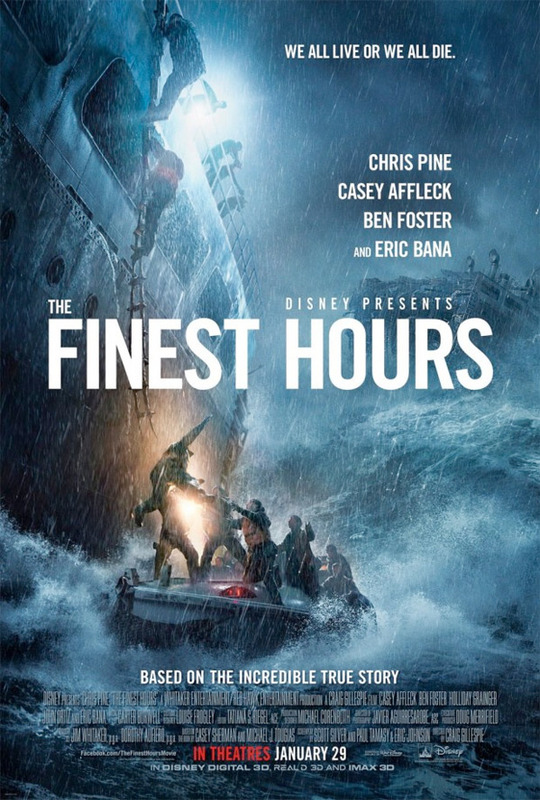 The Finest Hours is directed by filmmaker Craig Gillespie, of the films Million Dollar Arm, Fright Night, Lars and the Real Girl and Mr. Woodcock previously. The screenplay is written by Eric Johnson & Paul Tamasy. Walt Disney Studios will release The Finest Hours in theaters around the world starting January 29th, 2016 early next year. Anyone interested in seeing this? About the same as the first. Not bad really. Seeing as they stuck that "Disney Presents" tag on the poster, I am not expecting a sad ending. This really happened, albeit not exactly this way. You can read about it on the net. Yes, its a happy ending, but not w/o losses.